Earlier this year, Marvel Comics debuted new variants of their Captain America and Thor characters. The new Captain America is a black man and the new Thor is a warrior woman. Those changes made a lot of fans upset. 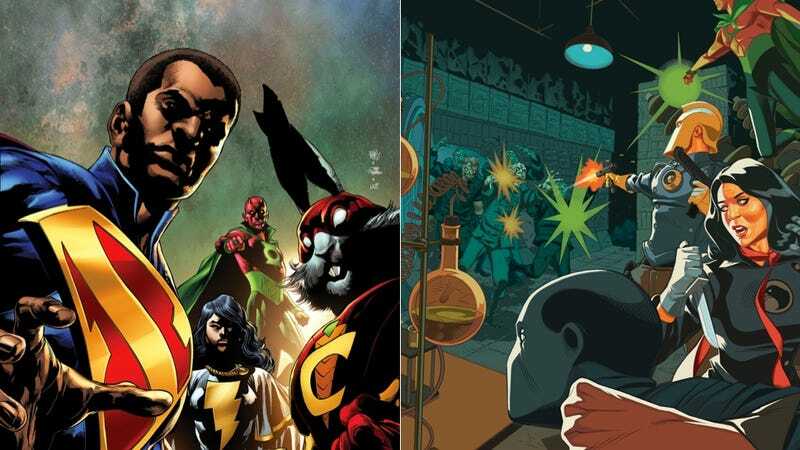 But comics legend Grant Morrison is featuring a black Superman and loads of racially diversified, gender-swapped versions of established superheroes. And he doesn't care about what anyone thinks. This week sees the release of The Multiversity: The Society of Superheroes: Conquerors of Counter-World #1, the second chapter in a dimension-spanning epic that's been years in the making. (Preview of the issues are below.) The Multiversity so far has been all about the imminent destruction of all the parallel realities in existence. The series carries on the longtime DC Comics' tradition of having superheroes cross over between multiple dimensions and letting fans meet different versions of the characters they know in different contexts. "Each world's experiencing its own version of a crisis event and the fun thing has been to create the superheroes' different responses in those specific realities," Morrison explained during a phone interview yesterday morning. Last month's issue focused on Cal Kent—the black Superman Morrison created a while back—encountering other heroes from alternate universes. As mentioned above, those heroes are familiar yet different in important ways. "I'm not doing that in response to anything," Morrison told me. "I just put characters in like that because I like to represent the world as I see it. So, for me, it should be more diverse. And I'm constantly trying to make sure that I can include different groups of society. I'm a middle-aged white guy so I really can't speak for [these groups.] I can't be a spokesperson. All I can do is represent life as I see it. I can put them in my comics and give people the credit of existing in the streets and representing that." Created with a team of artists, the series seems to want to reflect a multiplicity of tones and understandings in terms of how to implement superhero ideas. Drawn by Chris Sprouse, The Society of Superheroes chapter coming out tomorrow does that by looking back to the roots of modern adventure fiction. "For me, this was about, on its own terms, how to do a pulp-style DC Universe," Morrison said. "I had an idea for that the old pulp characters that DC has the rights to—The Shadow, Doc Savage and all that—a while back but Brian Azzarello was working on them then. So, I went with hybrids of established DC characters. I wanted to create a very specific feeling in this book, a slightly archaic and retro tone but at the same time in the present day. It's in a world where something like WWII just ended in 2010. It's got this old-fashioned feel but it's set right now and just so happens to be in a parallel universe." So, not only does Morrison switch the Blackhawks team of ace fighter pilots to be all women, he also says that he modeled off the Spice Girls a bit. Superman's not the center of the action here. Instead, it's the helmeted sorcerer that harks back to DC Comics' Golden Age. "Doc Savage was the Man of Bronze so we made Doc Fate The Man of Gold," the Scottish writer said. "There's a scene where I wanted to get across a sense that Doc Fate might be hiding his identity because of tensions in that world that we're not made privy to, unless you look into the meanings of that scene." Morrison likens The Multiversity to a set of big musical piece working in unison. "This issue is a strain of the kind of the fugue that's The Multiversity. Each book has its own very specific tone. This world that seems retro-utopian is not actually. It's quite dark and the whole story is how these characters—who seem quite hopeful from the first scene—are almost indistinguishable from the bad guys by the end. Those pulp characters were created during wartime and their brand of justice was pretty harsh. That's what the story I wanted to tell, the blood and thunder of it." The Multiversity: The Society of Superheroes: Conquerors of Counter-World #1 is out tomorrow at comics shops and digital storefronts everywhere.